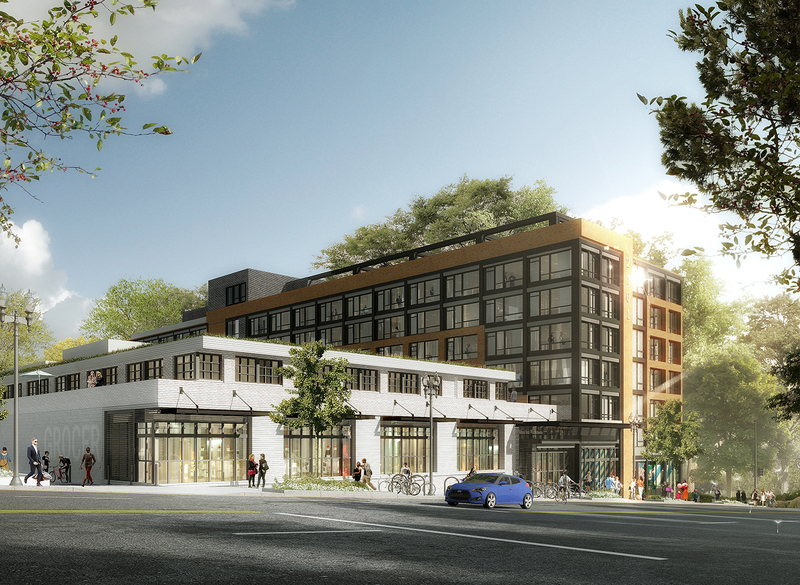 The JBG Cos. has a plan for the former Holiday Inn in Glover Park, where it will reuse part of the structure and develop an addition to bring residential over food-focused retail to the community. JBG is calling the project at 2101 Wisconsin Ave. NW The Glover House. The eight-story building will feature a mix of 226 apartments and two-level townhouse apartments. One selling point: More than 50 percent of the units will be two, three or four bedrooms, and each unit will have the same number of bedrooms and bathrooms. JBG Principal Anthony Greenberg said The Glover House is aimed at the same kind of residents who would live in Georgetown rowhouses. The hotel closed in 2015. The land is owned by The Donohoe Companies, which also had offices there until 2016. JBG and Donohoe entered into an agreement a year ago in which JBG purchased Donohoe’s leasehold interest. The ground floor of The Glover House will feature a 15,000-square-foot space for a specialty grocer, as well as two 2,500-square-foot spaces for additional food uses. The Washington Business Journal’s Rebecca Cooper reported in February that JBG and Trader Joe’s were in talks for the space, but Greenberg would not confirm any tenants on Thursday. Other amenities will include private terraces, floor-to-ceiling windows, two lounges, underground parking and a rooftop pool with monument views. Donohoe is the contractor, and construction is underway. Greenberg said JBG expects to deliver the project in mid-2019. JBG is working with architect Eric Colbert and Associates on the building design and Edit Lab at Streetsense on the interiors. The exterior will incorporate three distinct structures with separate facades to blend into the neighborhood and add a modern look to the more traditional Georgetown brick style, Greenberg said. JBG will maintain the tower portion of the hotel, where The Glover House’s lobby and amenity deck will be located. The developer will demolish the wing of the hotel parallel to Wisconsin, and construct a wood-frame apartment structure.